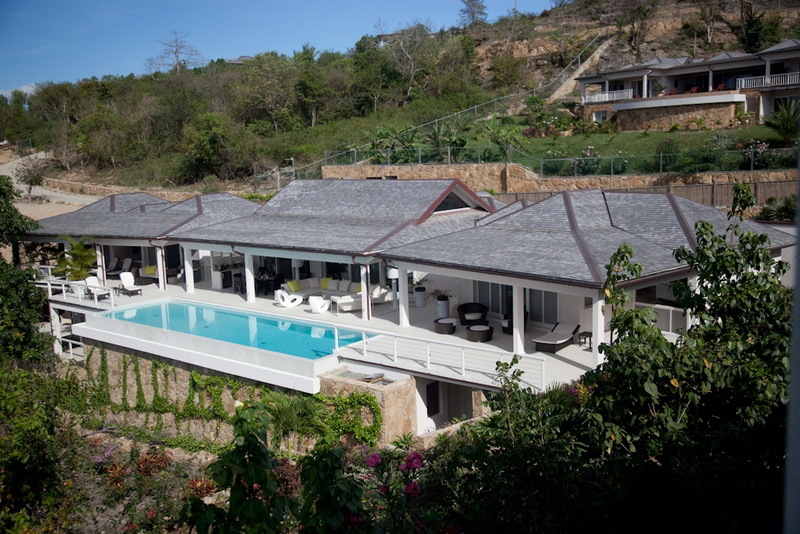 5 Bedrooms – Exceptional, elegantly decorated villa in Antigua for rent on hill top, with private gym. 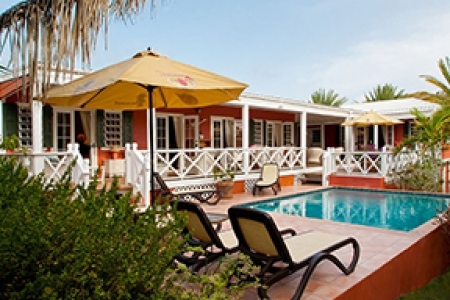 The villa offers wonderful Caribbean Sea views and it is at a short walk from a secluded beach. 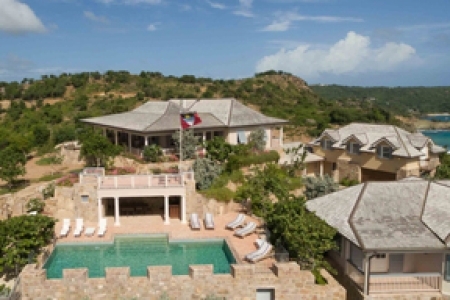 Luxury holiday villa in Antigua for chic, sophisticated Caribbean living. 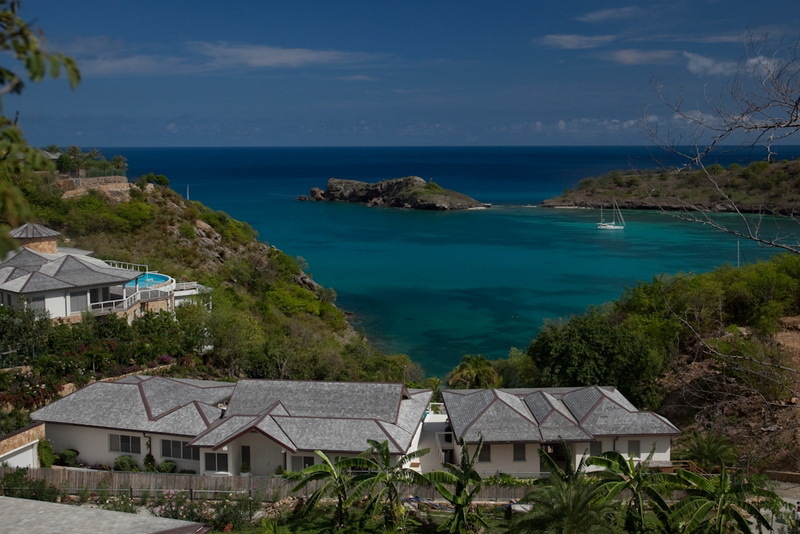 The villa sits with splendor at Galley Bay Heights, overlooking the turquoise waters of the Caribbean Sea. 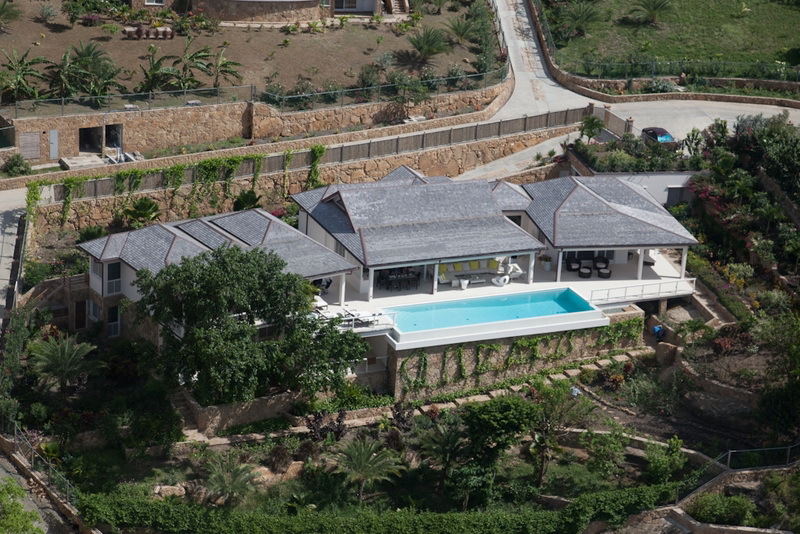 The villa spreads over 7000 sq. 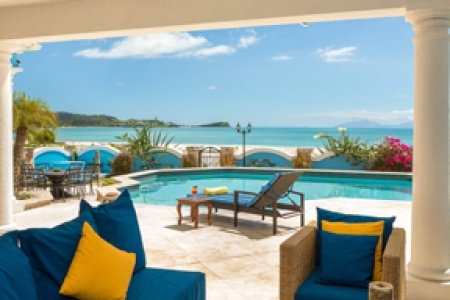 ft. of living and entertaining space and consists of two wings connected by shaded verandas and stairs; from every viewpoint of the villa you can enjoy spectacular views of the ocean and of the mature garden. 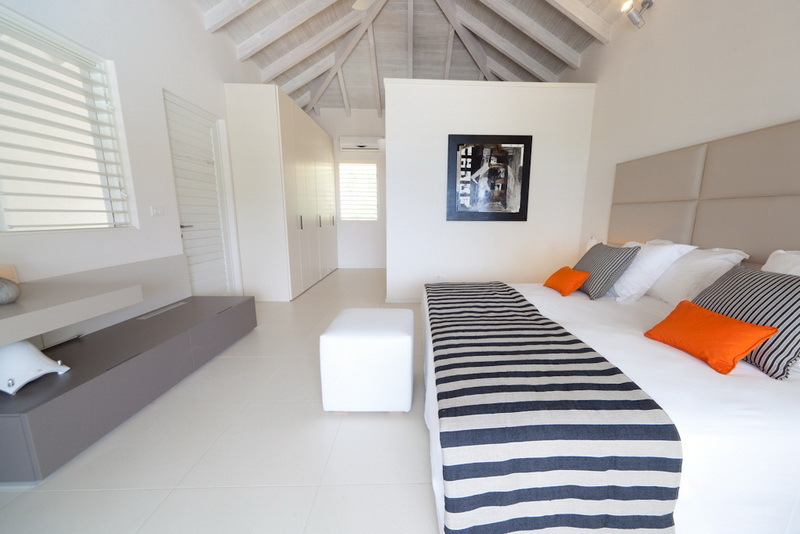 The cool Caribbean breeze is constant all year round but for added comfort air condition and fans are installed throughout and in all of the five elegant en-suite bedrooms. 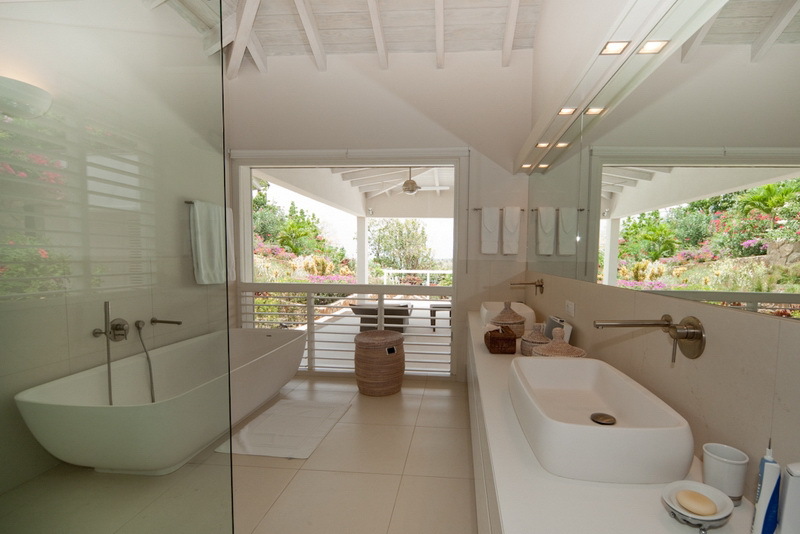 The owners' love of the arts is visible throughout the villa where magnificent paintings decorate the rooms. The furnishings represent the best of Italian design, such as the Dada kitchen, the Cassina Sofas, the Porro library shelves, the lights by Flos and Foscarini, Fontana Arte and other well-known designer brands. 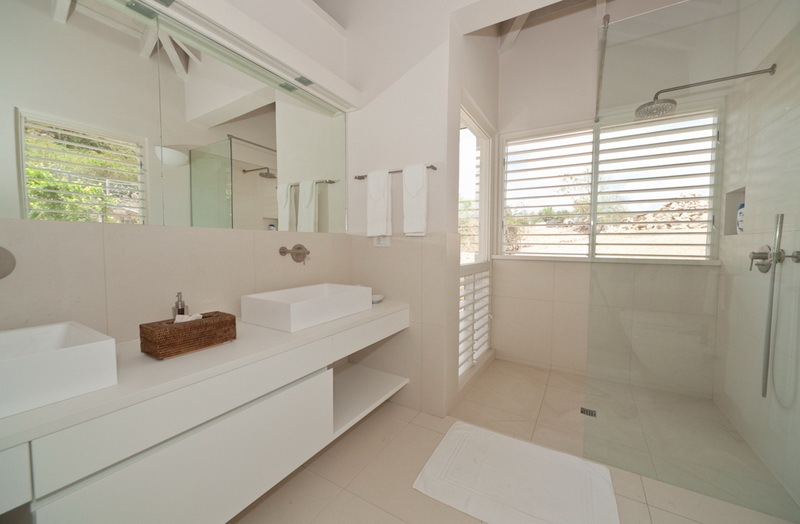 The villa includes: five bedrooms, five bathrooms, guest bathroom, living room, internal and external dining room, large kitchen, equipped gym, tv room, outdoor lounge areas, expansive deck area, long pool, lounge chairs, BBQ, outdoor bar. 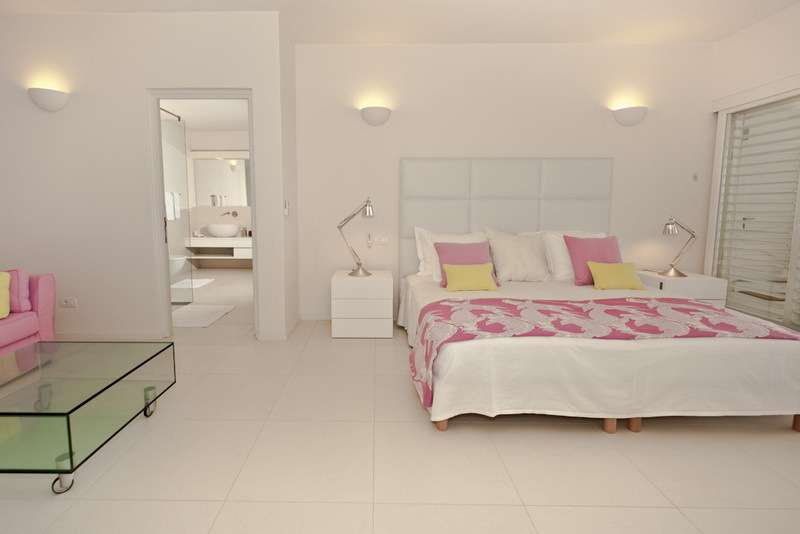 The villa has 5 elegant, en-suite bedrooms. 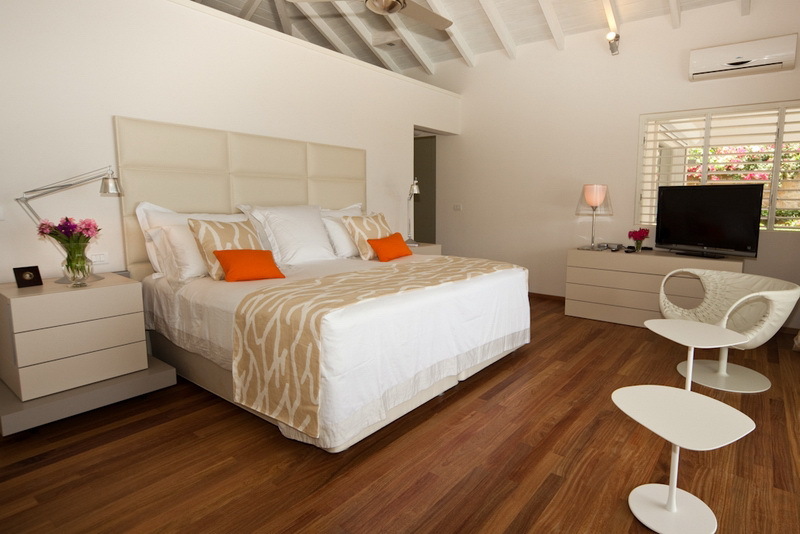 The master bedroom is located in the same wing of the common areas and it is an amazing suite overlooking the turquoise sea water of the Caribbean Sea, with access to the main terrace and the pool. 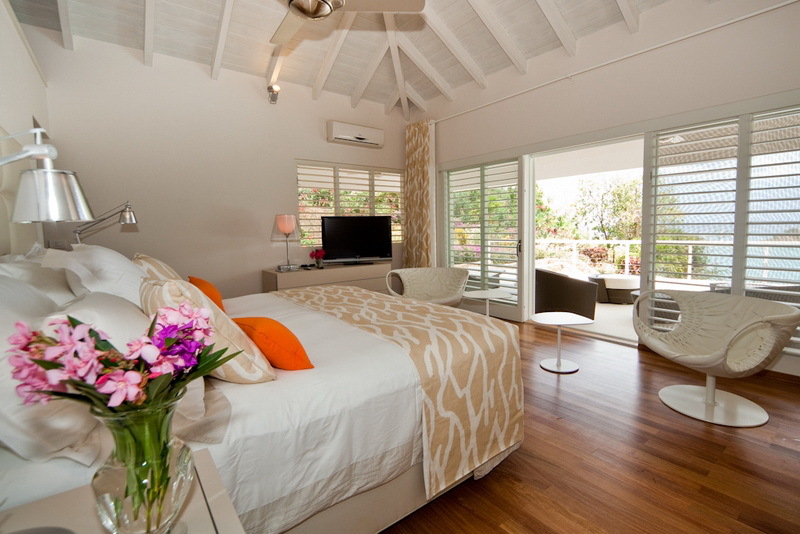 It is decorated with first class furnishing including king size bed, walk-in closet, chest of draws and cable TV. 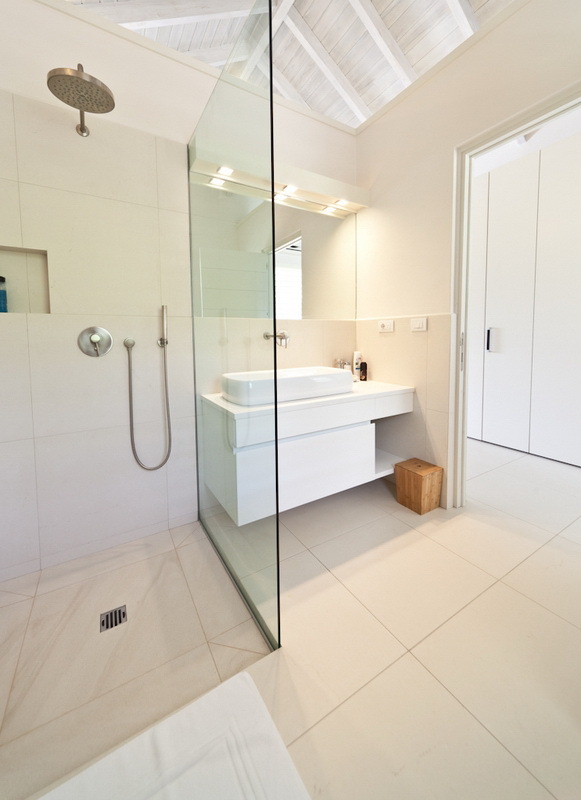 The bathroom is amazing with double vanities, walk-in shower and bath tub. 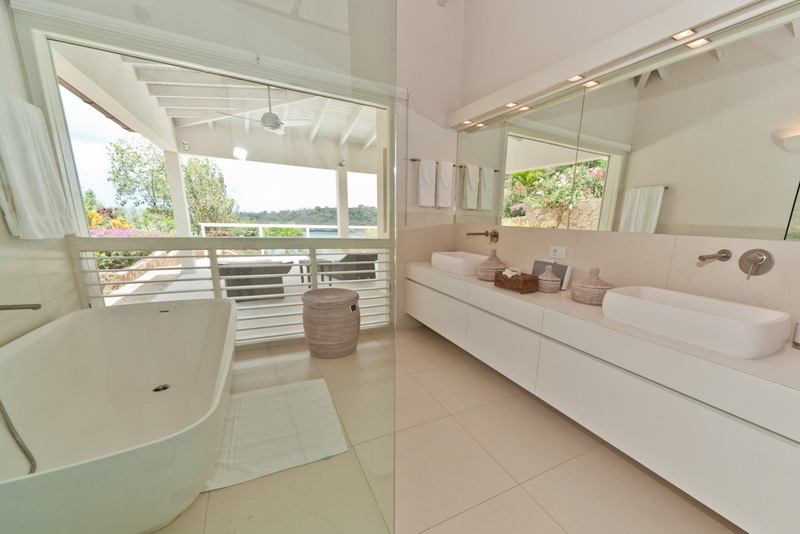 The other four gracious and luxuriously-appointed en-suite bedrooms are located in the second wing, two at the top level and two at the lower level of the property. 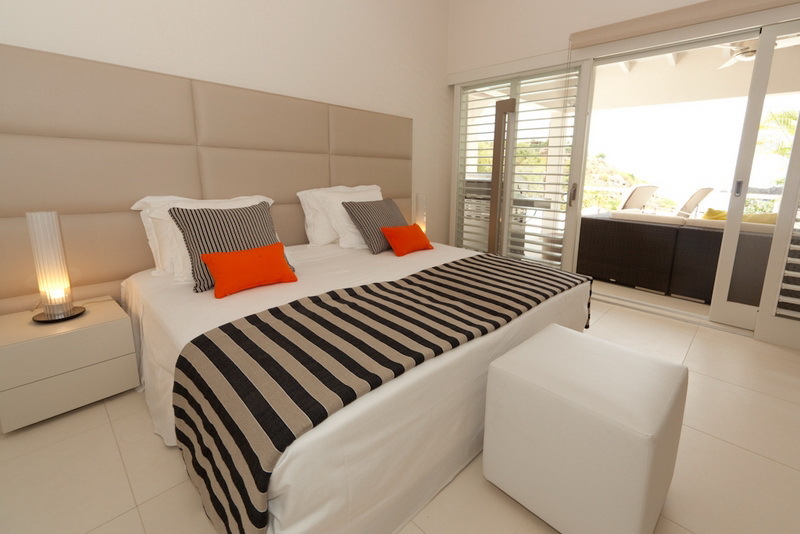 They are all en-suite, have queen bed, modern style furnishing, ceiling fan and A/C. 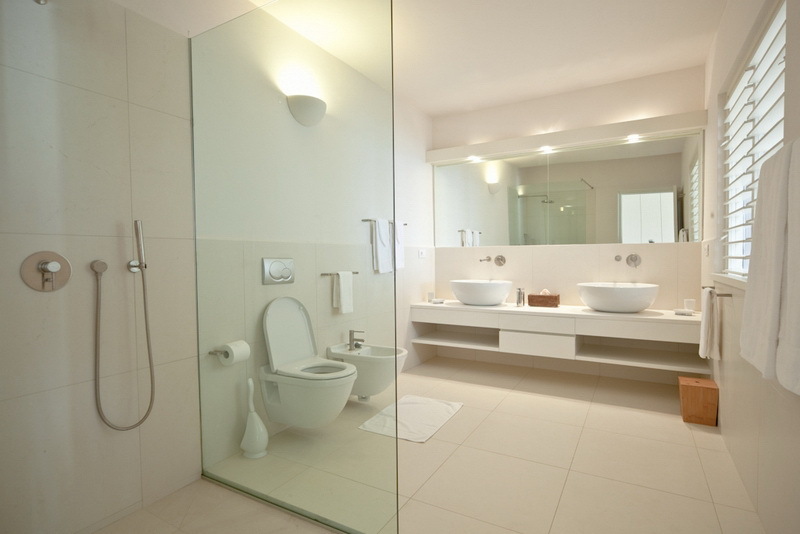 All rooms are very spacious and airy. 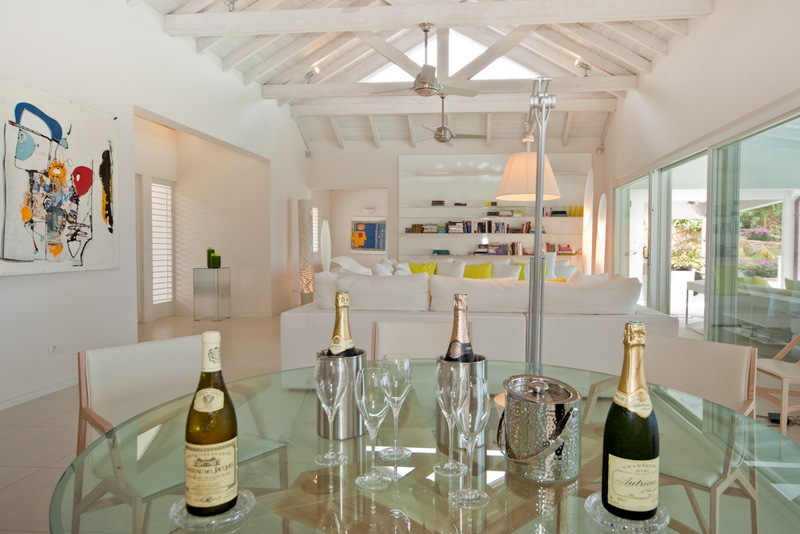 The living area enjoys stunning views of the Caribbean Sea and it is tastefully furnished with white L-shaped sofas, a coffee table, a lamp, custom made built in book case. It is only steps away from the pool and the deck area. 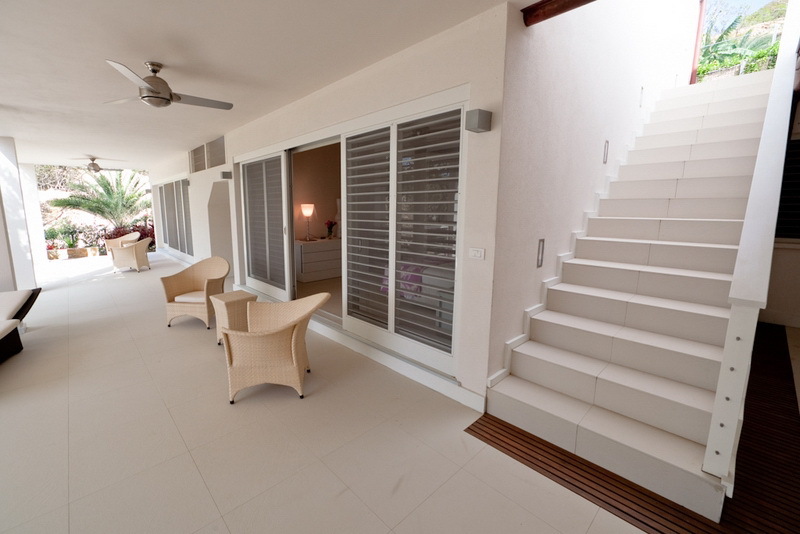 The predominant white color of the floors, walls and furniture gives an almost surreal feeling creating a striking contrast with the surrounding tropical colors of the sky, sea and lush garden. Simply and chic, the internal dining room is decorated with a round table and a chest of draws, various pieces of accents accurate the room. 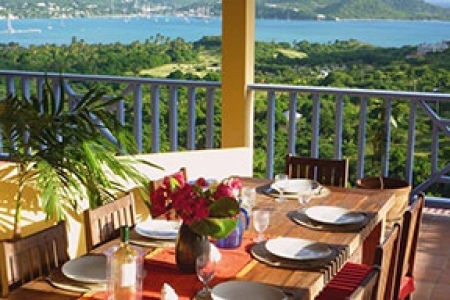 Sitting here you will enjoy amazing views over the bay below. 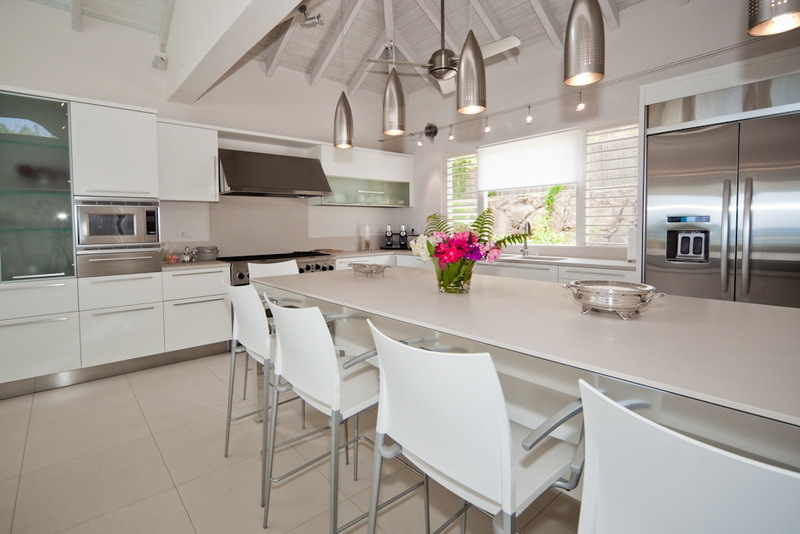 The kitchen sits on the same room of the living and internal dining room. The kitchen is custom made with white granite top from Italy and it is fitted with all stainless steel appliances such as eight burner stove with professional double oven, double doors refrigerator, dishwasher, microwave oven, espresso coffee maker, standard coffee maker and several small appliances useful for cooking. 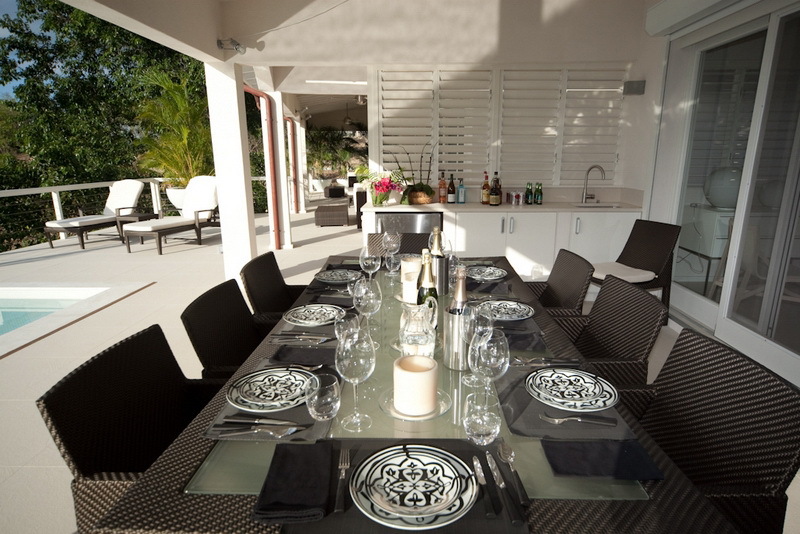 Just between the villa and the pool area, there is the external dining area with rectangular shape table, outdoor bar with sink and BBQ. 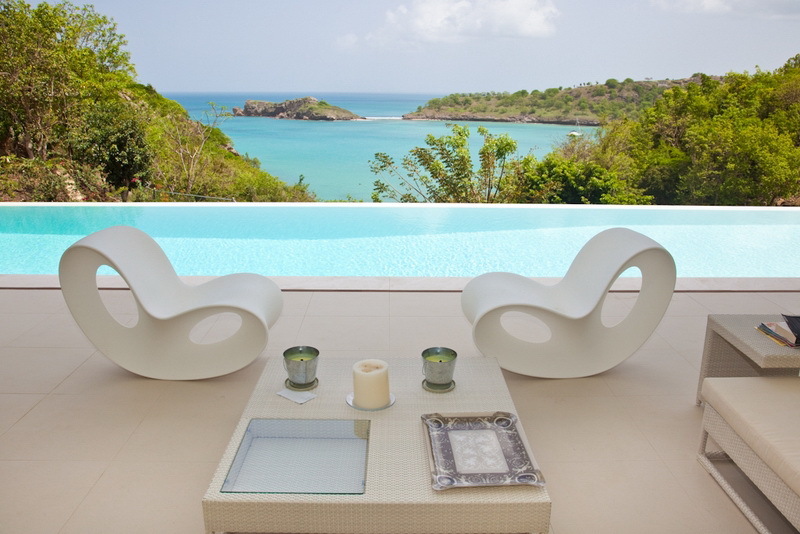 The veranda is furnished with sofas, coffee tables, lounge chairs and from every angle you will enjoy stunning views over the Caribbean Sea. 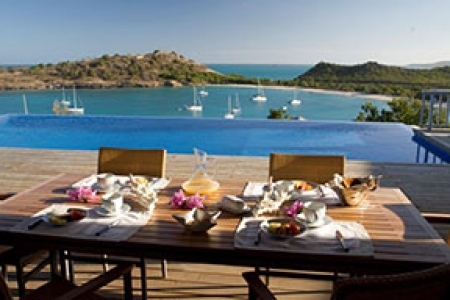 The villa offers a variety of relaxing lounge areas located on the terraces by the pool or just in front of the bedrooms, where comfortable outdoor lounge chairs, sofas and coffee table are placed. 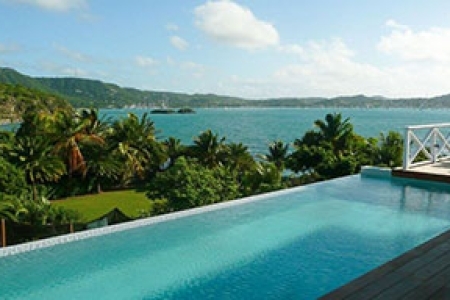 The infinity pool is very long, ideal for guests who love to swim. This large family / TV room is on the lower level of the first wing of the property and provides a large television with surrounded sound system, comfortable extra-large sofa, and center table. 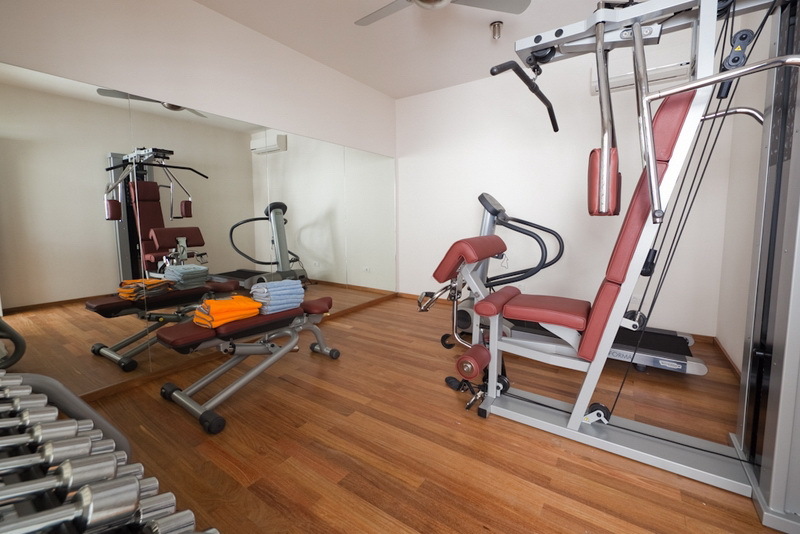 An amazing home size gym equipped with state-of-the -art equipment such as treadmill, weight system, free weights and AB crunch machine, yoga math and enormous mirror. 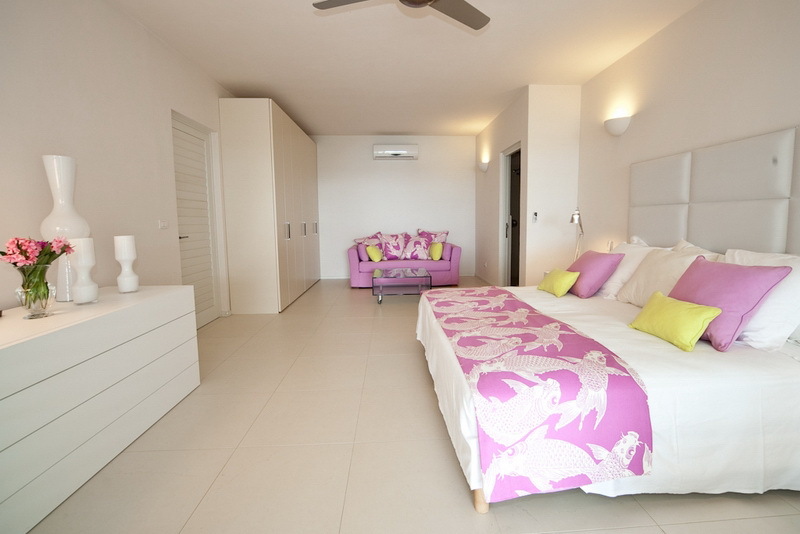 The room is fitted with both air-conditioning and ceiling fan. The un-spoilt, little beach of the compound is at few steps away from the villa. 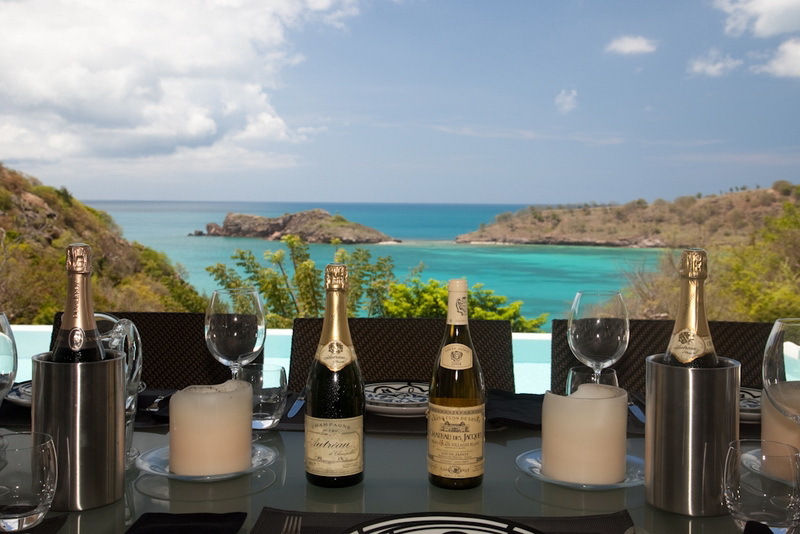 The beach of Galley Bay is at a short walk distance or few minutes by car, the beach of Hawksbill is at about eight minute drive and the beautiful Deep Bay, the one you will admire from the property, is about ten minute drive.